With the 2018 FIFA World Cup running from 14 June to 15 July, it’s officially football season in London and, in true British fashion, no match can go unwatched without a pint in hand. Thankfully, there’s no shortage of sports bars or classic pubs across the city that are airing the matches for this year’s competition. Here’s our pick of the best 10 sports bar to catch a game in – or you can use this as a handy guide for where to avoid until the whole thing is over. 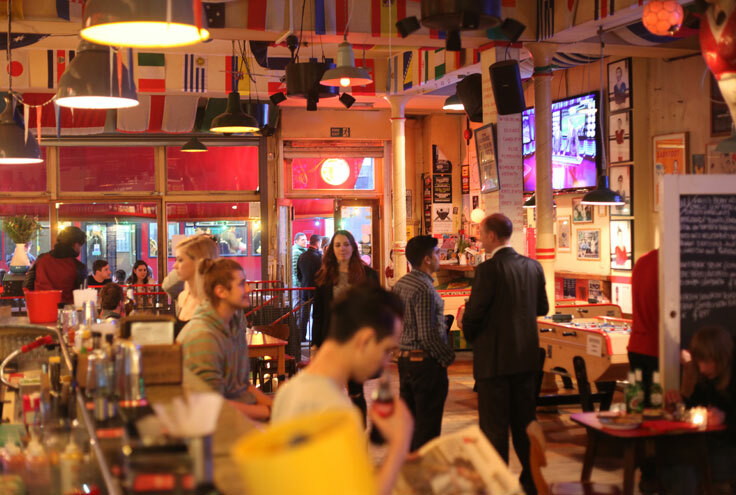 What: It may inhabit a former shoe wholesalers, but imaginary footie boots are what you’ll need at this regular E1 fixture, as Bar Kick is the perfect place to watch a football match or even participate in a small one of your own. With table football tables scattered throughout this Shoreditch bar and TV screens hanging on almost every wall, there’s no better place to catch the World Cup while scoring goals of your own. Eat and drink: The El Cubano sandwich paired with a bottle of Estrella Galicia. 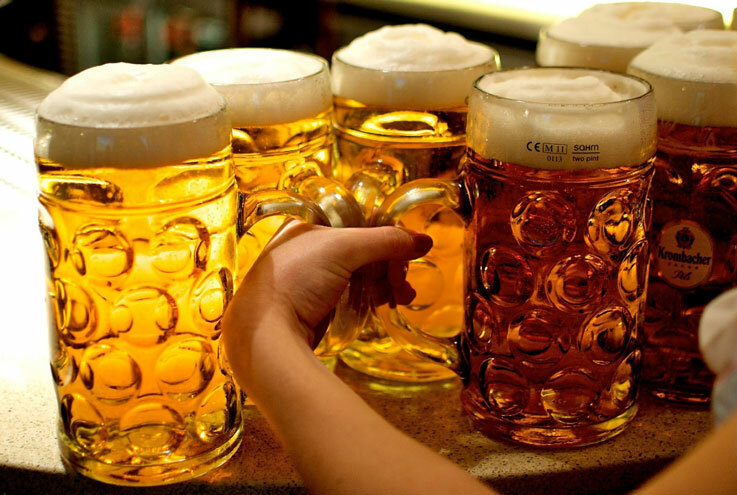 What: In honour of Germany’s win in the last World Cup, kick off the 2018 games in a traditional Bavarian bierkeller without leaving central London. Football fans can pick their libation of choice from an extensive menu of German beers and ciders, or indulge in one of this watering hole’s special World Cup drinks and food packages – think Jagermeister shots or two steins of beer. Eat and drink: A bayerische brezeln (aka a classic pretzel) and a pint of Krombacher Pils. What: Not only is this Bermondsey pub screening World Cup matches, but it has also got some on-theme decor in honour of the competition – flags from around the world can be found hanging throughout the pub. Find your flag or bring your own to watch this year’s matches. Eat and drink: Cajun cornflake chicken and an Aspall Isabel’s berry cider. 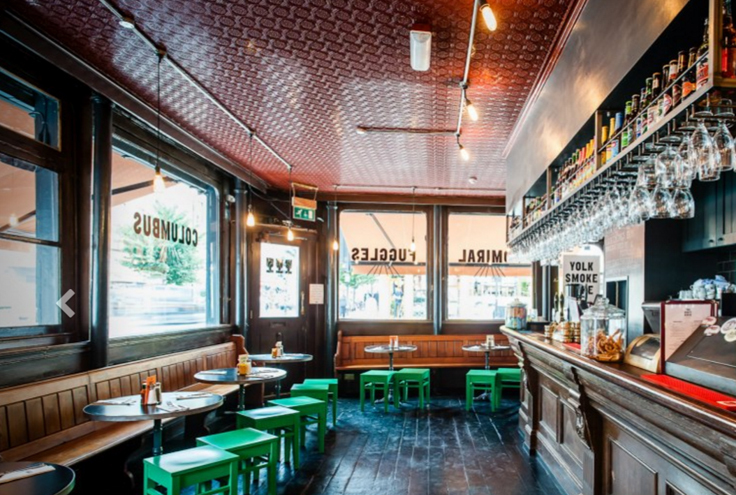 What: This quaint corner spot in Fitzrovia is set to be buzzing during the World Cup. There’s no shortage of drinks, whether your tipple of choice is lager, stout or cider, and no shortage of opportunities to catch the football here. If there’s a game you simply cannot miss or want a front-and-centre seat for, be sure to arrive at the pub early as the Draft House doesn’t take any pre-bookings and the place is likely to be rammed. Eat and drink: The jalapeno mac ‘n’ cheese balls with an Oatmeal stout. What: For a completely immersive viewing experience, Greenwood is the perfect World Cup viewing destination. With a massive sports lounge complete with one screen in the front and another screen plus a projector in the rear, you can catch each game at every angle. If you want to secure your spot for a specific match, make sure to book online as Greenwood’s space can fill up fast. Eat and drink: The smoked BBQ short rib burger and a Lynchburg lemonade (a mix of Jack Daniel’s with lemon and lime). What: Football fans should look no further than Fulham for a classic beer and sports atmosphere. With TVs positioned all around the pub, there’s no chance of missing any of this year’s FIFA highlights at this neighbourhood sports bar. Eat and drink: A classic sticky toffee pudding with a pint of the Bishops Tipple ale. 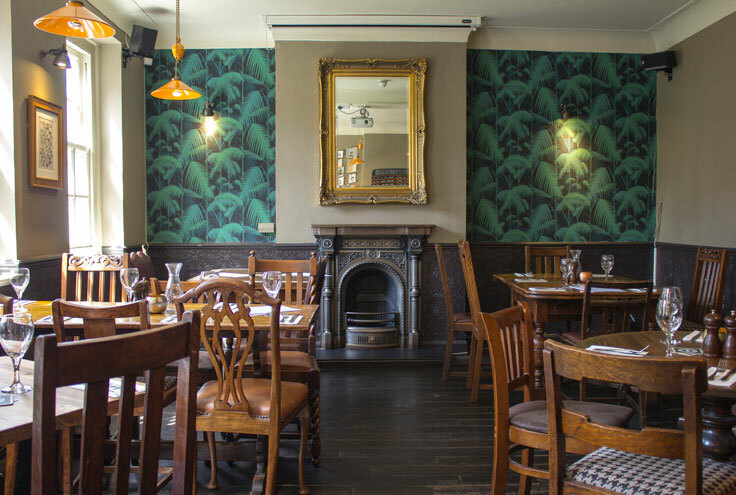 What: This Clerkenwell pub proves that the hipster’s favourite pint of craft beer can be enjoyed while watching a not so hipster football match. 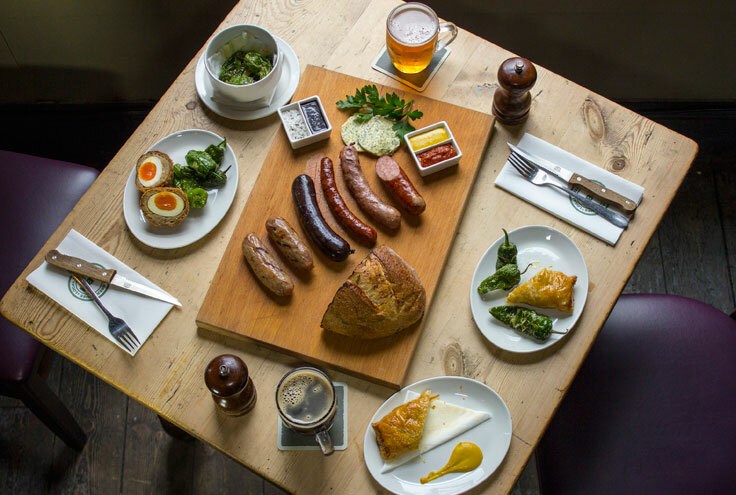 In addition to screening the games on a projector in the pub, the Old Red Cow is also serving speciality hot dogs for a few select matches – think bratwursts for when Germany plays. Being the olde worlde drinking den that it is, this pub is the perfect place to watch a football match minus the manic stadium crowds. Eat and drink: Nibble on a Scotch egg while sipping on a Beavertown Gamma Ray. What: Expect an extra level of authenticity in this sports bar, as alongside the massive screens hanging overhead are sports kits that have previously been worn by famous athletes. With a viewing schedule already available online, it’s easy to plan your own FIFA match schedule well in advance. 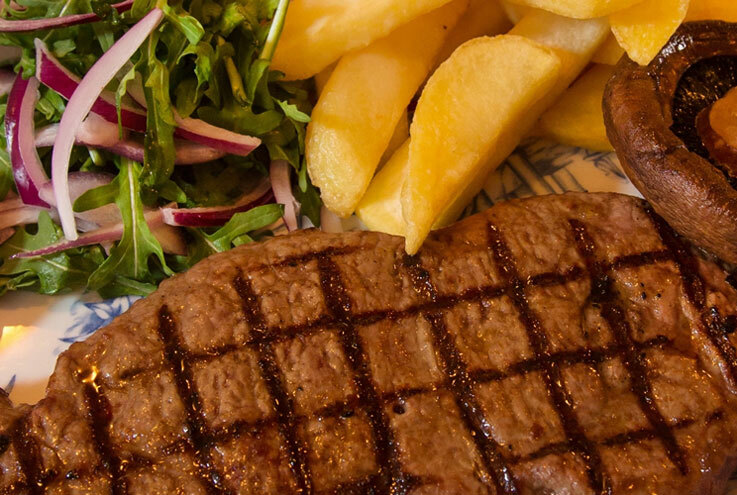 Eat and drink: We love the steak and ale pie with a pint of Brewdog Nanny State. What: For anyone working in the City, The Trading House is ideal for catching a post-work football match, as the bar is only showing matches screened during the week. If you’re keen to watch one surrounded by fellow pub-goers, each match will be shown on a big screen in the main bar area. If you fancy a more solo experience, private screens can be booked in advance to watch in the bar’s mezzanine area. Eat and drink: A prawn and chorizo skewer and a gin and tonic made with one of the bar’s 14 gin options. 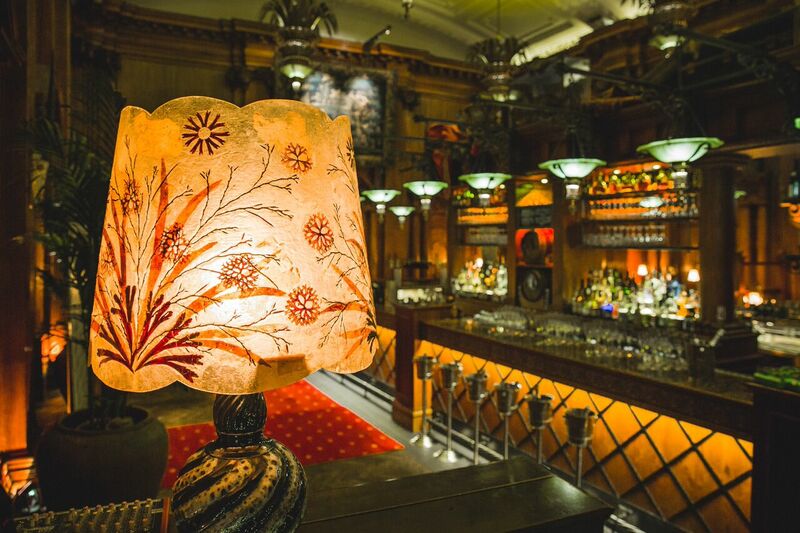 What: Head to this Soho destination for a friendly football match. As the pub itself boasts that guests will receive a ‘warm Irish welcome’ upon arrival, expect a cheery greeting before settling in to watch a live game on one of the many big screens found inside the pub. 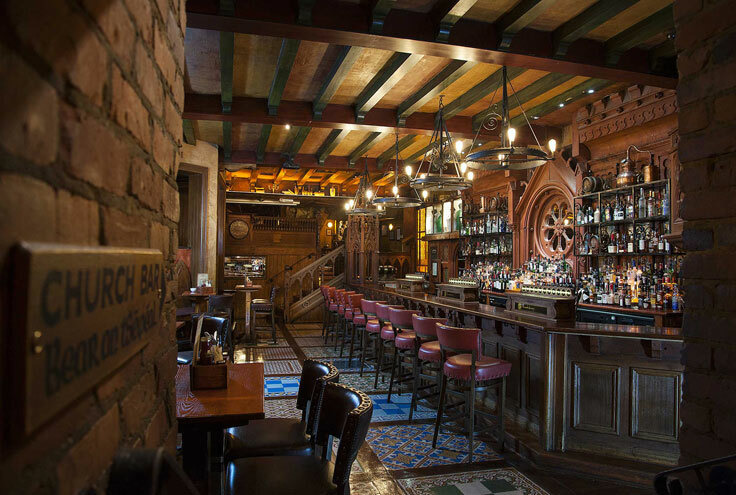 Eat and drink: Enjoy a classic fish & chips while washed down with one of the pub’s four Irish whiskey and American craft beer pairings. For more of the sporting action, check out our list of London’s best sports bars.